Are you like me, who would like to have spicy chicken alone for a whole meal? Then this recipe is for you. 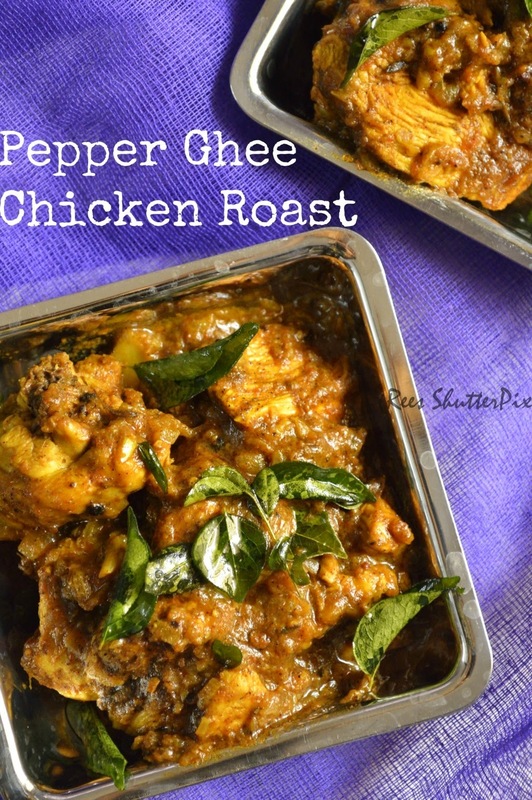 Loaded with pepper and flavours of ghee and curry leaves is a delicacy. I have used curry cut chicken pieces, you can also cut into small pieces which will be more tasty with spices blended. Use only ghee to prepare this recipe. 1. Prepare the required ingredients. In a tadka pan, heat ghee and roast the spices under "To Roast and grind to a fine paste". In a food processor, add chopped tomatoes and the roasted spices. Blend to a fine paste with 1/4 cup of water. 2. Finely chop or blend once the shallots and garlic for a coarse mixture. In a wide non-stick pan, heat ghee. Add curry leaves and fry for a minute. Remove the fried curry leaves and keep aside. 3. Add fennel seeds and onions. Saute for a couple of minutes till onion turns translucent. Add ginger garlic garlic paste. Saute nicely with the onions. Add the tomato paste. Saute and let it cook for a couple of minutes. 4. Add spices: turmeric powder and salt. Add cleaned chicken pieces. Add freshly crushed pepper powder, red chilli powder. Mix well and let it cook with the spices and tomato mixture for 2 minutes. 5.As it starts to reduce and the spices have blended. Add water. Cover and cook for 8-10 minutes or till the chicken is cooked and the water id reduced to semi-gravy consistency. Add fried curry leaves and ghee. Yes please to spicy chicken dish. I love it. Enough to go with rice. So yummy and inviting recipe..